We’d love your help. Let us know what’s wrong with this preview of Love on the Lifts by Jill Santopolo. Pick your path to find the perfect guy in this personalized romance set on the ski slopes! A book version of The Bachelorette! What better way to spend your vacation than on the slopes? In this unique romance, the reader’s in the driver’s seat—creating her own path through the narrative and ending with one of eleven different guys. By making selections at the end of each c Pick your path to find the perfect guy in this personalized romance set on the ski slopes! A book version of The Bachelorette! To ask other readers questions about Love on the Lifts, please sign up. I've always loved Choose Your Own Adventure books and this was a cute version and a quick read. This style of "you choose" does not work for me. :( I wish I could have liked it more. A short, cute, choose your own adventure type story of finding the perfect guy for you. The endings were all really short. Especially the one with the guy who likes Harry Potter. I appreciate that the option of not getting a boyfriend was there, too. i checked this book out from my library thinking it would be cool to do a choose your own story book......... i sat down & got to my “happy ending” within 20 minutes. i don’t think this format is for me. Read my full review HERE at Into the Hall of Books. When I was young, I used to love to read Choose Your Own Adventure stories. I'd read them over and over, making sure to arrive at the different endings each time. I wanted to see what adventures were possible within the book. One just wasn't enough. The concept of this type of story was so exciting to me, one where I was in control of how things turned out. This is what Jill Santopolo has done with Love On The Lifts, except we're not choosing ad Read my full review HERE at Into the Hall of Books. When I was young, I used to love to read Choose Your Own Adventure stories. I'd read them over and over, making sure to arrive at the different endings each time. I wanted to see what adventures were possible within the book. One just wasn't enough. The concept of this type of story was so exciting to me, one where I was in control of how things turned out. This is what Jill Santopolo has done with Love On The Lifts, except we're not choosing adventure - we're choosing a chance for love. As the story begins, you and your sister Angie are at the airport, on your way to a ski vacation with your parents. Your boyfriend Nate has broken your heart, and you just aren't feeling the fun of the upcoming vacation. Angie tells you that she has a plan - you need to kiss someone you meet on the ski mountain, you need to fall in love on the lifts. Hmm, you're not so sure! You'd rather ski and hang out with your sister and just not think of romantic things. BUT Angie convinces you that it takes a boy to get over a boy, and you eventually agree to try out her plan. The "choose your own adventure" part of the story begins once you both make it out on the slopes. 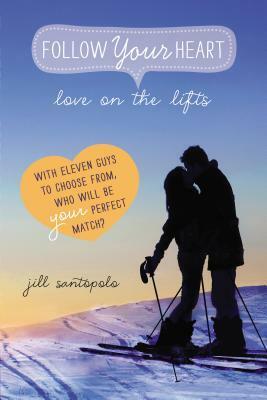 When Love On The Lifts by Jill Santopolo arrived, I read it immediately because it sounded like so much fun - and it was. It was a quick read that left me smiling and flipping pages, but in a really fun way. There are something like eleven choices for an ending - a ski instructor, a handsome twin, deciding to hang out with sister Angie instead of finding a guy, hanging out alone - so, yeah, several possibilities. AND true to what we all know of these types of "choose your own adventure" books, the opportunity to decide what to do next pops up every few pages, which made me feel in control of what was going on. I ended up "finding love" with Charlie - he's a nice guy out on the slopes that I spot and decide to spend the day skiing with. He is hilarious and charming and loves old movies. It's a good match and helps me take my mind off of my awful ex-boyfriend. *SO while I've been taking care of my Dad recently and because this book was so fun to read, I picked up Love On The Lifts and read it again - twice. I ended up with two very different endings, both a lot of fun. I ended up hanging out with my sister Angie, which is always a good time of course (YAY sisters, I absolutely love mine) and I also found love with a guy named Orion, who happens to be the son of the ski resort owner. An extremely quick and easy read! Very little by way of quality but good, light-hearted fun elevated it to 3 stars. Maybe a little nostalgia for the choose your own adventures that I loved as a kid helped a bit too. LOL! Such a cheesy, fun, good time! I love choose your own adventure books...one about finding love is a hoot! My teen girls are going to love this!!! "Love on the Lifts" is a fun little read about a teen girl, who has recently broken up with her boyfriend and is trying to mend her broken heart. She and her sister devise a plan to find a new love while on a family vacation in the mountains at a ski lodge. This book is unique as it presents you with different scenarios where you can select a young man to date and has you jumping to different pages throughout the book as you continue to read. "Love on the Lifts" is unlike any story I have read be "Love on the Lifts" is a fun little read about a teen girl, who has recently broken up with her boyfriend and is trying to mend her broken heart. She and her sister devise a plan to find a new love while on a family vacation in the mountains at a ski lodge. I kind of want to downgrade "Summer Love" so I can tell you how much better this one is. It's SO much better. My only complaint is her overuse of the phrase "love on the lifts," which, come on, really? In most cases, you have multiple exit points from each scenario, and they're better written and more interesting with some people that just don't pan out. It's still a choose-your-own-adventure romance novel - it's nothing deep - but it's exactly what I hoped it would be. I have never read the choose your fate kind of stor6 before so I have nothing to compare it to. However, I did not like the second person point og view for it and really did not like any of the guys that much. This was a choose you own adventure book! I took two of the adventures and they were both really good! I absolutely adored the first book and I was so delighted to see a second book coming out. This time instead of a warm and hot summer romance, which means snow + warm and wonderful love. I can't remember exactly what I thought of the other book's endings, but I am delighted with this book's endings. We got both friendship and romance endings. So if you don't want to go for a hot date, you can just make friends with a lovely guy. Which is a wonderful option. Of course I read the book for the hot g I absolutely adored the first book and I was so delighted to see a second book coming out. This time instead of a warm and hot summer romance, which means snow + warm and wonderful love. I can't remember exactly what I thought of the other book's endings, but I am delighted with this book's endings. We got both friendship and romance endings. So if you don't want to go for a hot date, you can just make friends with a lovely guy. Which is a wonderful option. Of course I read the book for the hot guys and the equally lovely hot kisses, but at times I just want to relax and go for friendship. It was still a bit awkward to read in the you do this and you do that, in other words second-person narrative. A narrative not often found in books, and while it fits with this book (after all you are the protagonist), it still feels weird and out of place. I know I had that problem with the first book, and while it is a bit better now that I know it will happen it was still a bit strange and at times it took me a bit to get through the book. I loved all the guys we could pick from. There were some guys I didn't entirely like or whom I found a bit weird and too hungry for a pretty girl. Other guys were just perfect and I could just envision myself on the slopes (though I only know how slopes look from pictures or movies, so my image might be a bit off). I never skied so I couldn't imagine myself doing that, though it did sound like something I want to do someday (now only the money to travel to countries with mountains + snow (real snow)). All in all, I would highly recommend this book to everyone. It is a fun way to spend your afternoon. Just add a cup of hot chocolate + whipped cream and a cookie and enjoy! I will just be hoping that there will be more of these books coming out. I would be really sad if this one and the other one would be the only ones. When I was a kid I lived for the choose your own adventure books. I read every one I could get my hands on. First I'd go through and read it as if I was a big chickenshit, taking all the running scared options I could. After I died my cruel and horrible death that way (it always ended in death or tears), I'd go back and be the fearless hero, taking all the risks I could and getting an entirely different story. By this time I'd read at least half of the physical book, so I'd go through and play a When I was a kid I lived for the choose your own adventure books. I read every one I could get my hands on. First I'd go through and read it as if I was a big chickenshit, taking all the running scared options I could. After I died my cruel and horrible death that way (it always ended in death or tears), I'd go back and be the fearless hero, taking all the risks I could and getting an entirely different story. By this time I'd read at least half of the physical book, so I'd go through and play a couple different times to get more text. By the end, I was reading it front to back, making sure I didn't miss a single page of options. I read this one exactly that same way. Santopolo has everything here that made me love those books growing up. The second-person narrative, the chicken or fearless options, and of course, the page hoping. But it is her sticking so closely to that pattern that also disappointed me. The writing is very superficial, there's no depth or meat to any of the options. I know when your story is essentially only 10 pages its hard to get a heart-wrenching omg where are the tissues thing going, but it just felt . . . childish. It made me realize that I've probably outgrown exactly what drew me to this book in the first place. Santopolo DOES try to make it a book with a variety. It isn't just choose your boy by looks and personality. Sometimes you don't get a boy, sometimes you get a boy who's going to be a friend, sometimes you get HEA. So yes, because she did try, and because I had a hoot of a time doing my reading, 4 stars. But one of those stars is solely for the nostalgia factor. Love on the Lifts is the perfect teen choose your own romantic endeavor story. I remember the "choose your own adventure books" when I was growing up and always enjoyed the numerous choices I could make to create my own unique ending. Love on the Lifts is similar to those stories with a romantic twist. You find yourself with a broken heart, courtesy of your cheating boyfriend. Your family is headed to the slopes for a week of skiing. Your sister challenges you to meet and kiss a boy hoping it wi Love on the Lifts is the perfect teen choose your own romantic endeavor story. I remember the "choose your own adventure books" when I was growing up and always enjoyed the numerous choices I could make to create my own unique ending. Love on the Lifts is similar to those stories with a romantic twist. You find yourself with a broken heart, courtesy of your cheating boyfriend. Your family is headed to the slopes for a week of skiing. Your sister challenges you to meet and kiss a boy hoping it will help you forget your loser ex-boyfriend. You take the dare and are on the lookout for a kissable candidate. Who will it be? Red parka boy, the cute blonde, the snack bar guy, the list goes on and on. This book was so much fun! I read through several times making different choices each time and finding a new "happy ending" along the way. The book is well written and I was drawn into the story like I was actually experiencing each love story first hand. This is a great tale for teens! Ahhh, this book was too cute to handle. I loved the choose-your-own-adventure type books as a kid, so it's no wonder I like to pick up a choose-you-own romance book once in a while nowadays. However, I refuse to read these like a normal person. I read it once, making my own decisions, but then I have to go back through and experience every single choice. Yup, you read that right. EVERY. SINGLE. CHOICE. I'm aware this will probably make me seem slightly neurotic, but I don't care. It was way too muc Ahhh, this book was too cute to handle. I loved the choose-your-own-adventure type books as a kid, so it's no wonder I like to pick up a choose-you-own romance book once in a while nowadays. I loved these kind of books as a kid and honestly they're still kind of fun to read. longer review coming soon. I didn't care for this book at all. I felt that the adventures were very silly and rushed. I think that if this book was longer it would be much much better. I felt no feels for this book at all. I was excited for this one because I had never read anything like it before. Very disappointing and not worth the read in my opinion. I haven't read a choose your adventure book in years. I loved the cover of this book and then I saw what it was like and I was more excited to read it. It was really cute and sweet. When I'm reading a book sometimes I want to steer the characters my way and in this book I was the main character making the choices and finding love. It was great and I really liked it. Enjoy!!! This is one of those "you create your own story" books. Apparently I'm a very simple person because my story was so straightforward and short. Cute story. Fun to read this kind of book to mix things up. What is the point of a Choose Your Own Adventure with no unhappy endings? I ask you! The only reason I gave it two stars instead of one is because of the "Who needs a boy? Sister power!" ending. it was really cool how you could read it several times and get a different ending every time. You can't really review this book, but it was very fun to play. Jill Santopolo is the author of the The Light We Lost, the Alec Flint Mysteries, the Sparkle Spa series, and the Follow Your Heart books. She holds a BA in English Literature from Columbia University, an MFA in Writing for Children from the Vermont College of Fine Arts, and a certificate in Intellectual Property Law from NYU. Jill is also the Editorial Director of Philomel Books, an imprint of Pen Jill Santopolo is the author of the The Light We Lost, the Alec Flint Mysteries, the Sparkle Spa series, and the Follow Your Heart books. She holds a BA in English Literature from Columbia University, an MFA in Writing for Children from the Vermont College of Fine Arts, and a certificate in Intellectual Property Law from NYU. Jill is also the Editorial Director of Philomel Books, an imprint of Penguin Young Readers Group. When she’s not writing or editing, Jill is a thesis advisor at The New School in their MFA program in Writing for Children and Young Adults and is on the faculty of the Columbia Publishing Course. Jill has traveled all over the U.S.—and to Canada and Europe—to speak about writing and storytelling. She lives in New York City.